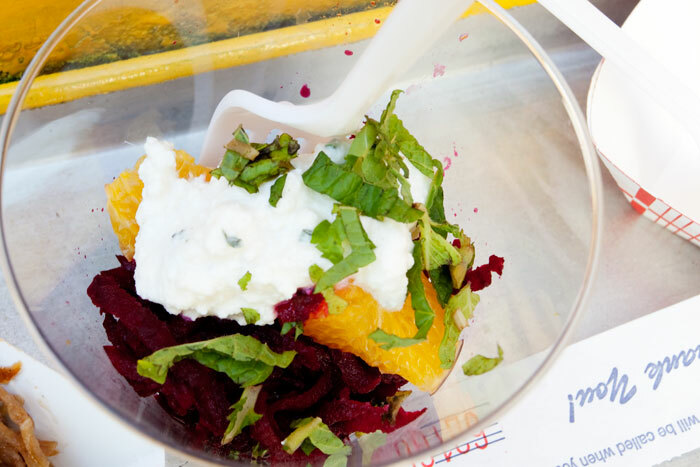 So the LA Street Food Fest on Saturday wasn’t a total epic failure. I did get to eat a few things, from The Gastrobus and Dim Sum Truck, and let me just say, there were pretty damn good. The only plus side of the VIP lounge was the free booze, trying out different teas from T Salon (which I found out is from NY), and catching the debut from the Dim Sum Truck. 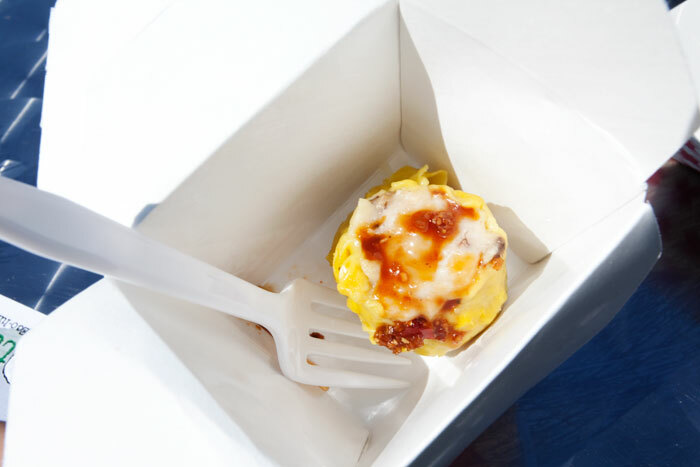 So some time last year I thought “Hey maybe I should start a food truck as well but what should I serve?” All my friends suggested a dim sum truck. It was a great idea but one problem I have no idea how to make dim sum. So much for that. I’m better at eating than running a food biz anyways. On Saturday when I walked up to the table, I was greeted by a very nice girl, sorry I forgot her name!, and the first thing I said to her was “You guys stole my idea!” Haha I hope they knew it was a joke..eh. 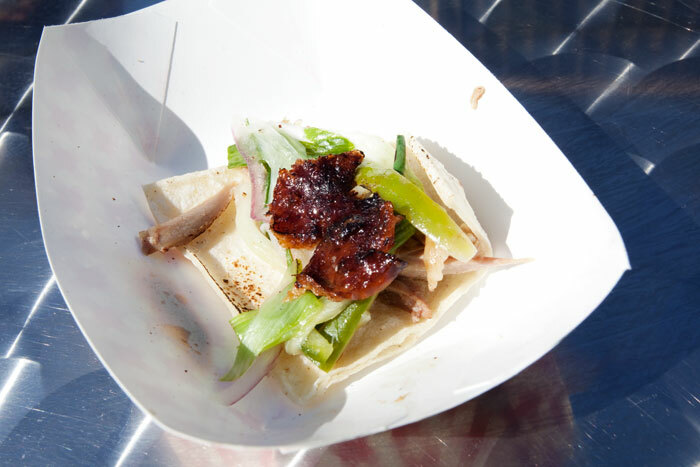 For their debut they offered a tasting of their Peking duck taco and siu mai with a spicy sauce. The taco could’ve been better like with a little bit more duck. We’ll see when they actually launch. As for the siu mai, it was one of the best siu mai I ever had. It was just the right size and in dim sum world that is quite important. I was surprised by the spicy sauce, maybe the girl told me about it but for some reason I didn’t hear her. Looking forward to this truck when they start rolling. The one truck that my sister and I did try was The Gastrobus. They did well in keeping the line moving. They offered few items for $3. We got a cup of beets, pulled pork with grits and a lemon dessert. The beets. I’m curious how Chef Medina cooked these because these were damn great. It was topped with cheese and fruits. 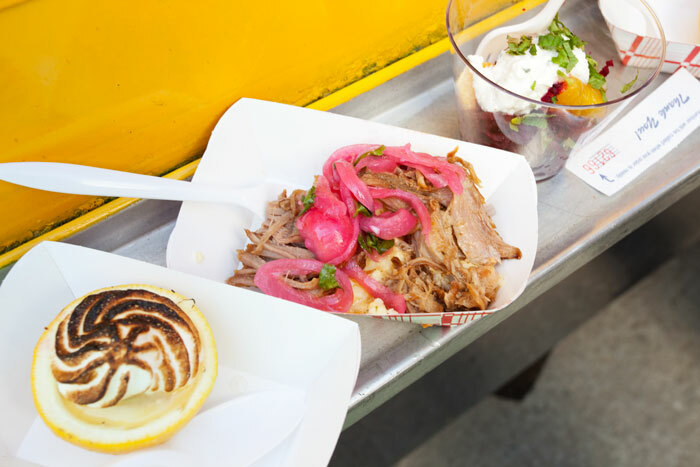 The pulled pork with grits topped with pickled onions was fantastic! I love pickled anything. The one thing that blew me away that day was the dessert. 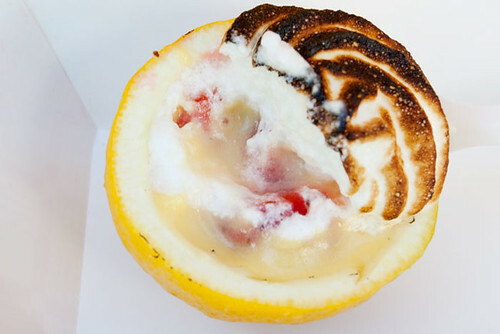 A hollowed out lemon filled with, I think, lemon custard and topped with meringue. When I dug in I found strawberries inside, surprise! 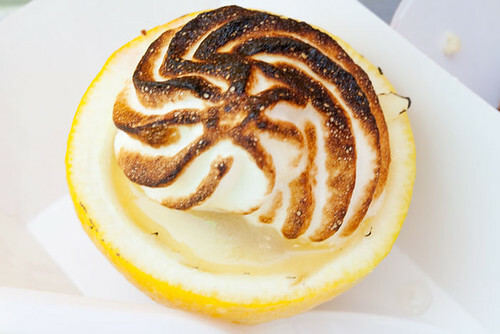 Just like everything they do at The Gastrobus, simple but damn frakkin tasty.